Edited By Claes Gejrot et al. 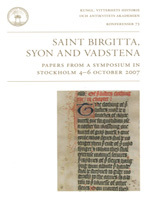 THE SYMPOSIUM Saint Birgitta, Syon and Vadstena, initiated by the Swedish Birgitta Foundation (Birgittastiftelsen), took place in Stockholm in October 2007. In this volume, medievalists and Birgittine scholars within various disciplines and from different countries contribute with papers presented on the occasion. The main topics are the two monasteries in England and Sweden, Syon Abbey and Vadstena, the reception and production of texts, but also archaeology, book illuminations and biographies of individual sisters and brothers. Additional papers deal with various aspects of other Nordic Birgittine houses and discuss Saint Birgitta and her Revelations.